Carbon nanotubes (CNTs) are allotropes of carbon with molecular structures that are tubular in shape, having diameters on the order of a few nanometers (approximately 1/50,000th of the width of a human hair) and lengths that can be as much as several millimeters. They are members of the fullerene structural family, which includes the spherical buckyballs. The ends of a nanotube may be capped with a hemisphere having a buckyball structure. Nanotubes are categorized as single-walled (SWNTs) and multi-walled nanotubes (MWNTs). These cylindrical carbon molecules form the strongest and stiffest materials yet discovered on Earth. They have unique electrical properties and are efficient conductors of heat. Their novel properties make them potentially useful in many applications in materials science, nanotechnology, electronics, optics, and architecture. Their usage, however, may be limited by their potential toxicity. 3D model of three types of single-walled carbon nanotubes. A 2006 editorial written by Marc Monthioux and Vladimir Kuznetsov in the journal Carbon has described the interesting and often misstated origin of the carbon nanotube. Much of the academic and popular literature attributes the discovery of hollow, nanometer sized tubes composed of graphitic carbon to Sumio Iijima of NEC in 1991. L. V. Radushkevich and V. M. Lukyanovich published clear images of 50-nanometer diameter tubes made of carbon in the Soviet Journal of Physical Chemistry in 1952. This discovery was largely unnoticed, as the article was published in the Russian language, and Western scientists' access to Soviet press was limited during the Cold War. It is likely that carbon nanotubes were produced before this date, but the invention of the transmission electron microscope allowed the direct visualization of these structures. Carbon nanotubes have been produced and observed under a variety of conditions prior to 1991. A paper by Oberlin, Endo, and Koyama published in 1976 clearly showed hollow carbon fibers with nanometer-scale diameters using a vapor-growth technique. Additionally, the authors show a TEM image of a nanotube consisting of a single wall of graphene. Later, Endo has referred to this image as a single-walled nanotube. Furthermore, in 1979, John Abrahamson presented evidence of carbon nanotubes at the 14th Biennial Conference of Carbon at Penn State University. The conference paper described carbon nanotubes as carbon fibers that were produced on carbon anodes during arc discharge. A characterization of these fibers was given as well as hypotheses for their growth in a nitrogen atmosphere at low pressures. In 1981, a group of Soviet scientists published the results of chemical and structural characterization of carbon nanoparticles produced by a thermocatalytical disproportionation of carbon monoxide. Using TEM images and XRD patterns, the authors suggested that their “carbon multi-layer tubular crystals” were formed by rolling graphene layers into cylinders. Additionally, they speculated that during rolling graphene layers into a cylinder, many different arrangements of graphene hexagonal nets are possible. They suggested two possibilities of such arrangements: circular arrangement (armchair nanotube) and a spiral, helical arrangement (chiral tube). In 1987, Howard G. Tennent of Hyperion Catalysis was issued a U.S. patent for the production of "cylindrical discrete carbon fibrils" with a "constant diameter between about 3.5 and about 70 nanometers…, length 10² times the diameter, and an outer region of multiple essentially continuous layers of ordered carbon atoms and a distinct inner core…." Iijima's discovery of multi-walled carbon nanotubes in the insoluble material of arc-burned graphite rods and Mintmire, Dunlap, and White's independent prediction that if single-walled carbon nanotubes could be made, then they would exhibit remarkable conducting properties helped create the initial buzz that is now associated with carbon nanotubes. Nanotube research accelerated greatly following the independent discoveries by Bethune at IBM and Iijima at NEC of single-walled carbon nanotubes and methods to specifically produce them by adding transition-metal catalysts to the carbon in an arc discharge. The arc discharge technique was well-known to produce the famed Buckminster fullerene on a preparative scale, and these results appeared to extend the run of accidental discoveries relating to fullerenes. The original observation of fullerenes in mass spectrometry was not anticipated, and the first mass-production technique by Krätschmer and Huffman was used for several years before realizing that it produced fullerenes. The discovery of nanotubes remains a contentious issue, especially because several scientists involved in the research could be likely candidates for the Nobel Prize. Many believe that Iijima's report in 1991 is of particular importance because it brought carbon nanotubes into the awareness of the scientific community as a whole. See the reference for a review of the history of the discovery of carbon nanotubes. Similar to the matter of nanotube discovery, the question what is the thinnest carbon nanotube is a matter of debate. The possible candidates can be given as follows: Nanotubes of diameter about 0.40 nm have been reported in 2000 literally on the same page of the journal Nature; however, they are not free standing, but enclosed in zeolite crystals or are innermost shells of the multi-wall nanotubes. Later, inner shells of MWNTs of only 0.3 nm in diameter have been reported. The thinnest free-standing nanotube, by September 2003, has diameter of 0.43 nm. The (n,m) nanotube naming scheme can be thought of as a vector (Ch) in an infinite graphene sheet that describes how to "roll up" the graphene sheet to make the nanotube. T denotes the tube axis, and a1 and a2 are the unit vectors of graphene in real space. Most single-walled nanotubes (SWNT) have a diameter of close to 1 nanometer, with a tube length that can be many thousands of times longer. The structure of a SWNT can be conceptualized by wrapping a one-atom-thick layer of graphite called graphene into a seamless cylinder. The way the graphene sheet is wrapped is represented by a pair of indices (n,m) called the chiral vector. 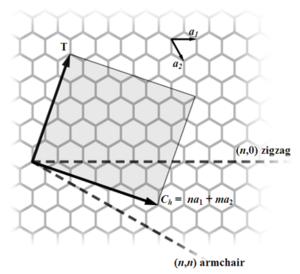 The integers n and m denote the number of unit vectors along two directions in the honeycomb crystal lattice of graphene. If m=0, the nanotubes are called "zigzag." If n=m, the nanotubes are called "armchair." Otherwise, they are called "chiral." Single-walled nanotubes are a very important variety of carbon nanotube because they exhibit important electric properties that are not shared by the multi-walled carbon nanotube (MWNT) variants. Single-walled nanotubes are the most likely candidate for miniaturizing electronics beyond the micro electromechanical scale that is currently the basis of modern electronics. The most basic building block of these systems is the electric wire, and SWNTs can be excellent conductors. One useful application of SWNTs is in the development of the first intramolecular field effect transistors (FETs). The production of the first intramolecular logic gate using SWNT FETs has recently become possible as well. To create a logic gate you must have both a p-FET and an n-FET. Because SWNTs are p-FETs when exposed to oxygen and n-FETs when unexposed to oxygen, it is possible to protect half of a SWNT from oxygen exposure, while exposing the other half to oxygen. This results in a single SWNT that acts as a NOT logic gate with both p and n-type FETs within the same molecule. Multi-walled nanotubes (MWNT) consist of multiple layers of graphite rolled in on themselves to form a tube shape. There are two models which can be used to describe the structures of multi-walled nanotubes. In the Russian Doll model, sheets of graphite are arranged in concentric cylinders, e.g. a (0,8) single-walled nanotube (SWNT) within a larger (0,10) single-walled nanotube. In the Parchment model, a single sheet of graphite is rolled in around itself, resembling a scroll of parchment or a rolled up newspaper. The interlayer distance in multi-walled nanotubes is close to the distance between graphene layers in graphite, approximately 3.3 Å (330 pm). The special place of double-walled carbon nanotubes (DWNT) must be emphasized here because they combine very similar morphology and properties as compared to SWNT, while improving significantly their resistance to chemicals. This is especially important when functionalization is required (this means grafting of chemical functions at the surface of the nanotubes) to add new properties to the CNT. In the case of SWNT, covalent functionalization will break some C=C double bonds, leaving "holes" in the structure on the nanotube and thus modifying both its mechanical and electrical properties. In the case of DWNT, only the outer wall is modified. DWNT synthesis on the gram-scale was first proposed in 2003 by the CCVD technique, from the selective reduction of oxides solid solutions in methane and hydrogen. Fullerites are the solid-state manifestation of fullerenes and related compounds and materials. Being highly incompressible nanotube forms, polymerized single-walled nanotubes (P-SWNT) are a class of fullerites and are comparable to diamond in terms of hardness. However, due to the way that nanotubes intertwine, P-SWNTs don't have the corresponding crystal lattice that makes it possible to cut diamonds neatly. This same structure results in a less brittle material, as any impact that the structure sustains is spread out throughout the material. A nanotorus is a theoretically described carbon nanotube bent into a torus (doughnut shape). Nanotori have many unique properties, such as magnetic moments 1000 times larger than previously expected for certain specific radii. Properties such as magnetic moment, thermal stability, etc. vary widely depending on radius of the torus and radius of the tube. Carbon nanobuds are a newly created material combining two previously discovered allotropes of carbon: carbon nanotubes and fullerenes. In this new material fullerene-like "buds" are covalently bonded to the outer sidewalls of the underlying carbon nanotube. This hybrid material has useful properties of both fullerenes and carbon nanotubes. In particular, they have been found to be exceptionally good field emitters. In composite materials, the attached fullerene molecules may function as molecular anchors preventing slipping of the nanotubes, thus improving the composite’s mechanical properties. Carbon nanotubes can have a length-to-diameter ratio as large as 28,000,000:1. This type of structure is unequaled by any other material. The bonding of atoms in a nanotube is described by applied quantum chemistry, specifically, orbital hybridization. The chemical bonding of nanotubes is composed entirely of sp2 bonds, similar to those of graphite. This bonding structure, which is stronger than the sp3 bonds found in diamonds, provides the molecules with their unique strength. Nanotubes naturally align themselves into "ropes" held together by Van der Waals forces. Under high pressure, nanotubes can merge together, trading some sp² bonds for sp³ bonds, giving the possibility of producing strong, unlimited-length wires through high-pressure nanotube linking. Carbon nanotubes are the strongest and stiffest materials yet discovered on Earth, in terms of tensile strength and elastic modulus respectively. Pioneering work led by Ray H. Baughman at the NanoTech Institute has shown that single- and multi-walled nanotubes can produce materials with toughness unmatched in the man-made and natural worlds. The strength of carbon nanotubes results from the covalent sp² bonds formed between individual carbon atoms. In 2000, a multi-walled carbon nanotube was tested to have a tensile strength of 63 gigapascals (GPa). (This, for illustration, translates into the ability to endure weight of 6300 kg on a cable with cross-section of 1 mm2.) Since carbon nanotubes have a low density for a solid of 1.3-1.4 g•cm−3, its specific strength of up to 48,000 kN•m•kg−1 is the best of known materials, compared to high-carbon steel's 154 kN•m•kg−1. Under excessive tensile strain, the tubes undergo plastic deformation, which means the deformation is permanent. This deformation begins at strains of approximately 5 percent and can increase the maximum strain the tube undergo before fracture by releasing strain energy. 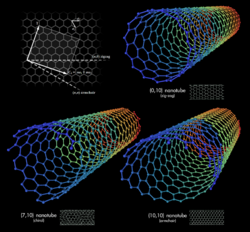 The above discussion referred to axial properties of the nanotube, whereas simple geometrical considerations suggest that carbon nanotubes should be much softer in the radial direction than along the tube axis. Indeed, TEM observation of radial elasticity suggested that even the van der Waals forces can deform two adjacent nanotubes. Nanoindentation experiments, performed by several groups on multiwalled carbon nanotubes,  indicated Young's modulus of the order of several GPa confirming that CNTs are indeed rather soft in the radial direction. Because of the symmetry and unique electronic structure of graphene, the structure of a nanotube strongly affects its electrical properties. For a given (n,m) nanotube, if n = m, the nanotube is metallic; if n − m is a multiple of 3, then the nanotube is semiconducting with a very small band gap, otherwise the nanotube is a moderate semiconductor. Thus all armchair (n=m) nanotubes are metallic, and nanotubes (5,0), (6,4), (9,1), etc. are semiconducting. In theory, metallic nanotubes can carry an electrical current density of 4E9 A/cm2, which is more than 1,000 times greater than metals such as copper. All nanotubes are expected to be very good thermal conductors along the tube, exhibiting a property known as "ballistic conduction," but good insulators laterally to the tube axis. It is predicted that carbon nanotubes will be able to transmit up to 6000 watts per meter per Kelvin at room temperature; compare this to copper, a metal well-known for its good thermal conductivity, which only transmits 385 watts per meter per Kelvin. The temperature stability of carbon nanotubes is estimated to be up to 2800 degrees Celsius in vacuum and about 750 degrees Celsius in air. As with any material, the existence of defects affects the material properties. Defects can occur in the form of atomic vacancies. High levels of such defects can lower the tensile strength by up to 85%. Another form of defect that may occur in carbon nanotubes is known as the Stone Wales defect, which creates a pentagon and heptagon pair by rearrangement of the bonds. Because of the very small structure of CNTs, the tensile strength of the tube is dependent on the weakest segment of it in a similar manner to a chain, where a defect in a single link diminishes the strength of the entire chain. The tube's electrical properties are also affected by the presence of defects. A common result is the lowered conductivity through the defective region of the tube. Some defect formation in armchair-type tubes (which can conduct electricity) can cause the region surrounding that defect to become semiconducting. Furthermore single monoatomic vacancies induce magnetic properties. The tube's thermal properties are heavily affected by defects. Such defects lead to phonon scattering, which in turn increases the relaxation rate of the phonons. This reduces the mean free path, and reduces the thermal conductivity of nanotube structures. Phonon transport simulations indicate that substitutional defects such as nitrogen or boron will primarily lead to scattering of high frequency optical phonons. However, larger scale defects such as Stone Wales defects cause phonon scattering over a wide range of frequencies, leading to a greater reduction in thermal conductivity. Due to their nanoscale dimensions, electron transport in carbon nanotubes will take place through quantum effects and will only propagate along the axis of the tube. Because of this special transport property, carbon nanotubes are frequently referred to as “one-dimensional” in scientific articles. Techniques have been developed to produce nanotubes in sizeable quantities, including arc discharge, laser ablation, high pressure carbon monoxide (HiPCO), and chemical vapor deposition (CVD). Most of these processes take place in vacuum or with process gases. CVD growth of CNTs can take place in vacuum or at atmospheric pressure. Large quantities of nanotubes can be synthesized by these methods; advances in catalysis and continuous growth processes are making CNTs more commercially viable. Nanotubes were observed in 1991 in the carbon soot of graphite electrodes during an arc discharge, by using a current of 100 amps, that was intended to produce fullerenes. However the first macroscopic production of carbon nanotubes was made in 1992 by two researchers at NEC's Fundamental Research Laboratory. The method used was the same as in 1991. During this process, the carbon contained in the negative electrode sublimates because of the high temperatures caused by the discharge. Because nanotubes were initially discovered using this technique, it has been the most widely used method of nanotube synthesis. The yield for this method is up to 30 percent by weight and it produces both single- and multi-walled nanotubes with lengths of up to 50 micrometers. In the laser ablation process, a pulsed laser vaporizes a graphite target in a high temperature reactor while an inert gas is bled into the chamber. The nanotubes develop on the cooler surfaces of the reactor, as the vaporized carbon condenses. A water-cooled surface may be included in the system to collect the nanotubes. It was invented by Richard Smalley and co-workers at Rice University, who at the time of the discovery of carbon nanotubes, were blasting metals with the laser to produce various metal molecules. When they heard of the discovery they substituted the metals with graphite to create multi-walled carbon nanotubes. Later that year the team used a composite of graphite and metal catalyst particles (the best yield was from a cobalt and nickel mixture) to synthesize single-walled carbon nanotubes. This method has a yield of around 70 percent and produces primarily single-walled carbon nanotubes with a controllable diameter determined by the reaction temperature. However, it is more expensive than either arc discharge or chemical vapor deposition. The catalytic vapor phase deposition of carbon was first reported in 1959, but it was not until 1993 that carbon nanotubes could be formed by this process. In 2007, researchers at the University of Cincinnati (UC) developed a process to grow 18 mm long aligned carbon nanotube arrays on a FirstNano ET3000 carbon nanotube growth system. During CVD, a substrate is prepared with a layer of metal catalyst particles, most commonly nickel, cobalt, iron, or a combination . The metal nanoparticles can also be produced by other ways, including reduction of oxides or oxides solid solutions. The diameters of the nanotubes that are to be grown are related to the size of the metal particles. This can be controlled by patterned (or masked) deposition of the metal, annealing, or by plasma etching of a metal layer. The substrate is heated to approximately 700°C. To initiate the growth of nanotubes, two gases are bled into the reactor: a process gas (such as ammonia, nitrogen, hydrogen, etc.) and a carbon-containing gas (such as acetylene, ethylene, ethanol, methane, etc.). Nanotubes grow at the sites of the metal catalyst; the carbon-containing gas is broken apart at the surface of the catalyst particle, and the carbon is transported to the edges of the particle, where it forms the nanotubes. This mechanism is still under discussion. The catalyst particles can stay at the tips of the growing nanotube during the growth process, or remain at the nanotube base, depending on the adhesion between the catalyst particle and the substrate. CVD is a common method for the commercial production of carbon nanotubes. For this purpose, the metal nanoparticles will be carefully mixed with a catalyst support (e.g., MgO, Al2O3, etc) to increase the specific surface area for higher yield of the catalytic reaction of the carbon feedstock with the metal particles. One issue in this synthesis route is the removal of the catalyst support via an acid treatment, which sometimes could destroy the original structure of the carbon nanotubes. However, alternative catalyst supports that are soluble in water have been shown to be effective for nanotube growth. If a plasma is generated by the application of a strong electric field during the growth process (plasma enhanced chemical vapor deposition*), then the nanotube growth will follow the direction of the electric field. By properly adjusting the geometry of the reactor it is possible to synthesize vertically aligned carbon nanotubes (i.e., perpendicular to the substrate), a morphology that has been of interest to researchers interested in the electron emission from nanotubes. Without the plasma, the resulting nanotubes are often randomly oriented. Under certain reaction conditions, even in the absence of a plasma, closely spaced nanotubes will maintain a vertical growth direction resulting in a dense array of tubes resembling a carpet or forest. Of the various means for nanotube synthesis, CVD shows the most promise for industrial scale deposition in terms of its price/unit ratio. There are additional advantages to the CVD synthesis of nanotubes. Unlike the above methods, CVD is capable of growing nanotubes directly on a desired substrate, whereas the nanotubes must be collected in the other growth techniques. The growth sites are controllable by careful deposition of the catalyst. Additionally, no other growth methods have been developed to produce vertically aligned nanotubes. In 2007, a team from Meijo University has shown a high-efficiency CVD technique for growing carbon nanotubes from camphor. A team of researchers at Rice University, until recently led by the late Dr. Richard Smalley, has concentrated upon finding methods to produce large, pure amounts of particular types of nanotubes. Their approach grows long fibers from many small seeds cut from a single nanotube; all of the resulting fibers were found to be of the same diameter as the original nanotube and are expected to be of the same type as the original nanotube. Further characterization of the resulting nanotubes and improvements in yield and length of grown tubes are needed. CVD growth of multi-walled nanotubes is used by several companies to produce materials on the ton scale, including NanoLab, Bayer, Arkema, Nanocyl, Nanothinx, Hyperion Catalysis, Mitsui, and Showa Denko. Fullerenes and carbon nanotubes are not necessarily products of high-tech laboratories; they are commonly formed in such mundane places as ordinary flames, produced by burning methane, ethylene, and benzene, and they have been found in soot from both indoor and outdoor air. However, these naturally occurring varieties can be highly irregular in size and quality because the environment in which they are produced is often highly uncontrolled. Thus, although they can be used in some applications, they can lack in the high degree of uniformity necessary to meet many needs of both research and industry. Recent efforts have focused on producing more uniform carbon nanotubes in controlled flame environments. Nano-C, Inc. of Westwood, Massachusetts, is producing flame synthesized single-walled carbon nanotubes. This method has promise for large scale, low cost nanotube synthesis, though it must compete with rapidly developing large scale CVD production. Determining the toxicity of carbon nanotubes has been one of the most pressing questions in Nanotechnology. Unfortunately such research has only just begun and the data are still fragmentary and subject to criticisms. Preliminary results highlight the difficulties in evaluating the toxicity of this heterogeneous material. Parameters such as structure, size distribution, surface area, surface chemistry, surface charge, and agglomeration state as well as purity of the samples, have considerable impact on the reactivity of carbon nanotubes. However, available data clearly show that, under some conditions, nanotubes can cross the membrane barriers and suggests that if raw materials reach the internal organs they can induce harmful effects as inflammatory and fibrotic reactions. A study led by Alexandra Porter from the University of Cambridge shows that CNTs can enter human cells and once inside accumulate in the cytoplasm and cause cell death. Results of rodent studies collectively show that regardless of the process by which CNTs were synthesized and the types and amounts of metals they contained, CNTs were capable of producing inflammation, epithelioid granulomas (microscopic nodules), fibrosis, and biochemical/toxicological changes in the lungs. Comparative toxicity studies in which mice were given equal weights of test materials showed that SWCNTs were more toxic than quartz, which is considered a serious occupational health hazard if it is chronically inhaled. As a control ultrafine carbon black was shown to produce minimal lung responses. "This is of considerable importance, because research and business communities continue to invest heavily in carbon nanotubes for a wide range of products under the assumption that they are no more hazardous than graphite. Our results suggest the need for further research and great caution before introducing such products into the market if long-term harm is to be avoided." "This study is exactly the kind of strategic, highly focused research needed to ensure the safe and responsible development of nanotechnology. It looks at a specific nanoscale material expected to have widespread commercial applications and asks specific questions about a specific health hazard. Even though scientists have been raising concerns about the safety of long, thin carbon nanotubes for over a decade, none of the research needs in the current U.S. federal nanotechnology environment, health and safety risk research strategy address this question." Although further research is required, results presented today clearly demonstrate that, under certain conditions, especially those involving chronic exposure, carbon nanotubes can pose a serious risk to human health. The joining of two carbon nanotubes with different electrical properties to form a diode has been proposed. The strength and flexibility of carbon nanotubes makes them of potential use in controlling other nanoscale structures, which suggests they will have an important role in nanotechnology engineering. The highest tensile strength an individual multi-walled carbon nanotube has been tested to be is 63 GPa. A 2006 study published in Nature determined that some carbon nanotubes are present in Damascus steel, possibly helping to account for the legendary strength of the swords made of it. Bulk nanotubes are masses of unorganized fragments of nanotubes. These materials may never achieve tensile strength comparable to that of individual tubes, but such composites may nevertheless yield strengths sufficient for many applications. Bulk carbon nanotubes have already been used as composite fibers in polymers to improve the mechanical, thermal, and electrical properties of the bulk product. Recent research by James D. Iverson and Brad C. Edwards has revealed the possibility of cross-linking CNT molecules prior to incorporation in a polymer matrix to form a super high strength composite material. This CNT composite could have a tensile strength on the order of 20 million psi (138 GPa, for 106 MN•m•kg−1), potentially revolutionizing many aspects of engineering design where low weight and high strength is required. Because of the great mechanical properties of the carbon nanotubule, a variety of structures have been proposed ranging from everyday items like clothes and sports gear to combat jackets and space elevators. Easton Bicycle Components has been in partnership with Zyvex, using CNT technology in a number of their components - including flat and riser handlebars, cranks, forks, seatposts, stems and aero bars. Carbon nanotubes have many properties—from their unique dimensions to an unusual current conduction mechanism—that make them ideal components of electrical circuits. For example, they have shown to exhibit strong electron-phonon resonances, which indicate that under certain direct current (dc) bias and doping conditions their current and the average electron velocity, as well as the electron concentration on the tube oscillate at terahertz frequencies. These resonances can be used to make terahertz sources or sensors. Nanotube based transistors have been made that operate at room temperature and that are capable of digital switching using a single electron. One major obstacle to realization of nanotubes has been the lack of technology for mass production. However, in 2001 IBM researchers demonstrated how nanotube transistors can be grown in bulk, not very differently from silicon transistors. The process they used is called "constructive destruction" which includes the automatic destruction of defective nanotubes on the wafer. This has since then been developed further and single-chip wafers with over ten billion correctly aligned nanotube junctions have been created. In addition it has been demonstrated that incorrectly aligned nanotubes can be removed automatically using standard photolithography equipment. The first nanotube integrated memory circuit was made in 2004. One of the main challenges has been regulating the conductivity of nanotubes. Depending on subtle surface features a nanotube may act as a plain conductor or as a semiconductor. A fully automated method has however been developed to remove non-semiconductor tubes. Most recently, collaborating American and Chinese researchers at Duke University and Peking University announced a new CVD recipe involving a combination of ethanol and methanol gases and quartz substrates resulting in horizontally aligned arrays of 95-98 percent semiconducting nanotubes. This is considered a large step towards the ultimate goal of producing perfectly aligned, 100 percent semiconducting carbon nanotubes for mass production of electronic devices. An alternative way to make transistors out of carbon nanotubes has been to use random networks of them. By doing so one averages all of their electrical differences and one can produce devices in large scale at the wafer level. This approach was first patented by Nanomix Inc.(date of original application in June 2002). It was first published in the academic literature by the Naval Research Laboratory in 2003 through independent research work. This approach also enabled Nanomix to make the first transistor on a flexible and transparent substrate. Nanotubes are usually grown on nanoparticles of magnetic metal (Fe, Co) that facilitates production of electronic (spintronic) devices. In particular control of current through a field-effect transistor by magnetic field has been demonstrated in such a single-tube nanostructure. The nanotube’s versatile structure allows it to be used for a variety of tasks in and around the body. Although often seen especially in cancer related incidents, the carbon nanotube is often used as a vessel for transporting drugs into the body. The nanotube allows for the drug dosage to hopefully be lowered by localizing its distribution, as well as significantly cut costs to pharmaceutical companies and their consumers. The nanotube commonly carries the drug one of two ways: the drug can be attached to the side or trailed behind, or the drug can actually be placed inside the nanotube. Both of these methods are effective for the delivery and distribution of drugs inside of the body. The solar cell developed at NJIT uses a carbon nanotubes complex, formed by carbon nanotubes and combines them with tiny carbon buckyballs (known as fullerenes) to form snake-like structures. Buckyballs trap electrons, although they can't make electrons flow. Add sunlight to excite the polymers, and the buckyballs will grab the electrons. Nanotubes, behaving like copper wires, will then be able to make the electrons or current flow . Carbon nanotubes have also been implemented in nanoelectromechanical systems, including mechanical memory elements (NRAM being developed by Nantero Inc.) and nanoscale electric motors (see Nanomotor). Carbon nanotubes have also been proposed as a possible gene delivery vehicle and for use in combination with radiofrequency fields to destroy cancer cells. In May 2005, Nanomix Inc has put on the market an electronic device - a Hydrogen sensor - that integrated carbon nanotubes on a silicon platform. Since then Nanomix has been patenting many such sensor applications such as in the field of carbon dioxide, nitrous oxide, glucose, DNA detection etc. Eikos Inc of Franklin, Massachusetts and Unidym Inc. of Silicon Valley, California are developing transparent, electrically conductive films of carbon nanotubes to replace indium tin oxide (ITO). Carbon nanotube films are substantially more mechanically robust than ITO films, making them ideal for high reliability touch screens and flexible displays. Printable water-based inks of carbon nanotubes are desired to enable the production of these films to replace ITO. Nanotube films show promise for use in displays for computers, cell phones, PDAs, and ATMs. A nanoradio, a radio receiver consisting of a single nanotube, was demonstrated in 2007. In 2008 it was shown that a sheet of nanotubes can operate as a loudspeaker if an alternating current is applied. The sound is not produced through vibration but thermoacoustically. Carbon nanotubes are said to have the strength of diamond, and research is being made into weaving them into clothes to create stab-proof and bulletproof clothing. The nanotubes would effectively stop the bullet from penetrating the body but the force and velocity of the bullet would be likely to cause broken bones and internal bleeding. A flywheel made of carbon nanotubes could be spun at extremely high velocity on a floating magnetic axis, and potentially store energy at a density approaching that of conventional fossil fuels. Since energy can be added to and removed from flywheels very efficiently in the form of electricity, this might offer a way of storing electricity, making the electrical grid more efficient and variable power suppliers (like wind turbines) more useful in meeting energy needs. The practicality of this depends heavily upon the cost of making massive, unbroken nanotube structures, and their failure rate under stress. Rheological properties can also be shown very effectively by carbon nanotubes. ↑ 1.0 1.1 Marc Monthioux, and Vladimir L. Kuznetsov. 2006. Who should be given the credit for the discovery of carbon nanotubes? Carbon. 44:1621. Retrieved February 13, 2009. ↑ A. Oberlin, M. Endo, and T. Koyama. 1976. Filamentous growth of carbon through benzene decomposition. J. Cryst. Growth. 32:335–349. ↑ Endo, Morinobu, and M.S. Dresselhaus. 2002. Carbon Fibers and Carbon Nanotubes (Interview, Nagano, Japan). MIT. Retrieved February 13, 2009. ↑ John Abrahamson, Peter G. Wiles, and Brian L. Rhoades. 1999. Structure of Carbon Fibers Found on Carbon Arc Anodes. Carbon. 37(11):1873. ↑ Howard G. Tennent, 1984. Carbon fibrils, method for producing same and compositions containing same. European Patent Office. Retrieved February 13, 2009. ↑ Sumio Iijima, 1991. Helical microtubules of graphitic carbon. Nature. 354:56–58. Retrieved February 13, 2009. ↑ J.W. Mintmire, et al. 1992. Are Fullerene Tubules Metallic? Physical Review Letters. 68:631–634. ↑ D.S. Bethune, et al. 1993. Cobalt-catalyzed growth of carbon nanotubes with single-atomic-layer walls. Nature. 363:605–607. Retrieved February 13, 2009. ↑ Sumio Iijima, 1993. Single-shell carbon nanotubes of 1-nm diameter. Nature. 363:603–605. ↑ The Discovery of Single-Wall Carbon Nanotubes at IBM. IBM. Retrieved February 13, 2009. ↑ 13.0 13.1 W. Krätschmer, 1990. Solid C60: a new form of carbon. Nature. 347:354–358. ↑ H.W. Kroto, 1985. C60: Buckminsterfullerene. Nature. 318:162–163. Retrieved February 13, 2009. ↑ Li-Chang Qin, et al. 2000. Single-walled 4A carbon nanotube arrays. Nature. 408:50. ↑ N. Wang, et al. 2000. The smallest carbon nanotube. Nature. 408:50. ↑ X. Zhao, et al. 2004. Smallest Carbon Nanotube is 3 A in diameter. Phys. Rev. Lett. 92:125502. ↑ T. Hayashi, et al. 2003. Smallest Freestanding Single-Walled Carbon Nanotube. Nano letters. 3:887. ↑ J.W. Mintmire, B.I. Dunlap, and C.T. White. 1992. Are Fullerene Tubules Metallic? Physical Review Letters. 68:631–634. ↑ Cees Dekker, 1999. Carbon nanotubes as molecular quantum wires. Physics Today. 52(5):22–28. ↑ R. Martel, V. Derycke, C. Lavoie, J. Appenzeller, K. K. Chan, J. Tersoff, and P.H. Avouris. 2001. Ambipolar Electrical Transport in Semiconducting Single-Wall Carbon Nanotubes. Physical Review Letters. 87(25):256805. Retrieved February 12, 2009. ↑ 22.0 22.1 22.2 22.3 22.4 Philip G. Collins, and Phaedon Avouris. 2000. Nanotubes for Electronics. Scientific American. 67-69. ↑ Home Page. Carbon Solutions, Inc. Retrieved February 12, 2009. ↑ Home Page. CarboLex. Retrieved February 12, 2009. ↑ E. Flahaut, R. Bacsa, A. Peigney, and C. Laurent. 2003. Gram-Scale CCVD Synthesis of Double-Walled Carbon Nanotubes. Chemical Communications. 12:1442–1443. Retrieved February 12, 2009. ↑ 26.0 26.1 Lei Liu, G.Y. Guo, C.S. Jayanthi, and S.Y. Wudate. 2002. Colossal Paramagnetic Moments in Metallic Carbon Nanotori. Physical Review Letters. 88(21):217206. Retrieved February 12, 2009. ↑ Maria Huhtala, Antti Kuronen, and Kimmo Kaski. 2002. Carbon nanotube structures: molecular dynamics simulation at realistic limit. Computer Physics Communications. 146:30. Retrieved February 12, 2009. ↑ L.X. Zheng, et al. 2004. Ultralong Single-Wall Carbon Nanotubes. Nature Materials. 3:673–676. ↑ Mei Zhang, 2005. Strong, Transparent, Multifunctional, Carbon Nanotube Sheets. Science. 309(5738):1215–1219. Retrieved February 13, 2009. ↑ Alan B. Dalton, 2003. Super-tough carbon-nanotube fibers. Nature. 423(6941):703. Retrieved February 13, 2009. ↑ Reinforcement. weizmann.ac.il. Retrieved February 12, 2009. ↑ Home Page. Australian Stainless Steel Development Association (ASSDA). Retrieved February 12, 2009. ↑ S. Belluci, 2004. Carbon nanotubes: physics and applications. Phys. Stat. Sol. (c). 2(1):34-47. ↑ H.G. Chae, and S. Kumar. 2006. Rigid Rod Polymeric Fibers. Journal of Applied Polymer Science. 100:791-802. ↑ B.G. Demczyk, Y.M. Wang, J. Cumings, M. Hetman, W. Han, A. Zettl, and R.O. Ritchie. 2002. Direct mechanical measurement of the tensile strength and elastic modulus of multiwalled carbon nanotubes. Materials Science and Engineering a. 334:173-178. ↑ M. Meo, M. Rossi. 2005. Prediction of Young’s modulus of single wall carbon nanotubes by molecular-mechanics based ﬁnite element modeling. Composites Science and Technology. 66:1597-1605. ↑ S.B. Meo and R. Andrews. 2001. Carbon Nanotubes: Synthesis, Properties, and Applications. Crit. Rev. Solid State Mater. Sci.. 26(3):145-249. ↑ R.S. Ruoff, et al. 1993. Radial deformation of carbon nanotubes by van der Waals forces. Nature. 364:514-516. ↑ I. Palaci, et al., 2005. Radial Elasticity of Multiwalled Carbon Nanotubes. Phys. Rev. Lett 94:175502. ↑ M.F. Yu, et al. 2000. Investigation of the Radial Deformability of Individual Carbon Nanotubes under Controlled Indentation Force. Phys. Rev. Lett. 85:1456-1459. ↑ Press release, July 23, 2003, 07.23.2003 Physicists build world's smallest motor using nanotubes and etched silicon. berkeley.edu. Retrieved February 12, 2009. ↑ Seunghun Hong and Sung Myung. 2007. Nanotube Electronics: A flexible approach to mobility. Nature Nanotechnology. 2:207-208. Retrieved February 13, 2009. ↑ Tatiana Makarova, and Fernando Palacio. 2006. Carbon Based Magnetism: An Overview of the Magnetism of Metal Free Carbon-based Compounds and Materials. (Amsterdam, NL; San Diego, CA: Elsevier. ISBN 9780444519474). ↑ N. Mingo, D.A. Stewart, D.A. Broido, and D. Srivasta. 2008. Phonon transmission through defects in carbon nanotubes from first principles. Physical Review B. 77:033418. Retrieved February 12, 2009. ↑ T.W. Ebbesen, and P.M. Ajayan. 1992. Large-scale synthesis of carbon nanotubes. Nature. 358:220–222. Retrieved February 13, 2009. ↑ Ting Guo, 1995. Self-Assembly of Tubular Fullerenes. J. Phys. Chem.. 99:10694–10697. ↑ Ting Guo, 1995. Catalytic growth of single-walled nanotubes by laser vaporization. Chem. Phys. Lett.. 243:49–54. Retrieved February 13, 2009. ↑ P. L. Walker, Jr., 1959. Carbon Formation from Carbon Monoxide-Hydrogen Mixtures over Iron Catalysts. I. Properties of Carbon Formed J. Phys. Chem. 63:133. ↑ M. José-Yacamán, 1993. Catalytic growth of carbon microtubules with fullerene structure. Appl. Phys. Lett. 62:657. Retrieved February 13, 2009. ↑ Wendy Beckman, 2007. UC Researchers Shatter World Records with Length of Carbon Nanotube Arrays. University of Cincinnati. Retrieved February 13, 2009. ↑ N. Inami, et al. 2007. Synthesis-condition dependence of carbon nanotube growth by alcohol catalytic chemical vapor deposition method. Sci. Technol. Adv. Mater. 8:292. Retrieved February 13, 2009. ↑ N. Ishigami, et al. 2008. Crystal Plane Dependent Growth of Aligned Single-Walled Carbon Nanotubes on Sapphire. J. Am. Chem. Soc.. 130(30):9918–9924. ↑ A. Eftekhari, Parvaneh Jafarkhani, and Fathollah Moztarzadeh. 2006. High-yield synthesis of carbon nanotubes using a water-soluble catalyst support in catalytic chemical vapor deposition. Carbon. 44:1343. Retrieved February 13, 2009. ↑ Z.F. Ren, 1998. | doi = 10.1126/science.282.5391.1105 Synthesis of Large Arrays of Well-Aligned Carbon Nanotubes on Glass. Science. 282:1105. Retrieved February 13, 2009. ↑ SEM images & TEM images of carbon nanotubes, aligned carbon nanotube arrays, and nanoparticles. nano-lab.com. Retrieved February 13, 2009. ↑ Carbon Nanotubes from Camphor: An Environment-Friendly Nanotechnology. Journal of Physics. Retrieved February 13, 2009. ↑ Jade Boyd, 2006. Rice chemists create, grow nanotube seeds. Rice University. Retrieved February 13, 2009. ↑ NanoLab multiwalled carbon nanotubes, aligned carbon nanotube arrays, nanoparticles, nanotube paper, dispersant, nanowires. nano-lab.com. Retrieved February 13, 2009. ↑ Nanothinx: Nanotubes, Nanomaterials, and Nanotechnology R&D (Products). nanothinx.com. Retrieved February 13, 2009. ↑ J.M. Singer, and J. Grumer. 1959. Carbon formation in very rich hydrocarbon-air flames. I. Studies of chemical content, temperature, ionization and particulate matter. Seventh Symposium (International) on Combustion. ↑ Liming Yuan, Kozo Saito, Chunxu Pan, F.A. Williams, and A.S. Gordon. 2001. Nanotubes from methane flames. Chemical physics letters. 340:237–241. Retrieved February 13, 2009. ↑ Liming Yuan, Kozo Saito, Wenchong Hu, and Zhi Chen. 2001. Ethylene flame synthesis of well-aligned multi-walled carbon nanotubes. Chemical physics letters. 346:23–28. ↑ H.M. Duan, and J.T. McKinnon. 1994. Nanoclusters Produced in Flames. Journal of Physical Chemistry. 98(49):12815–12818. ↑ L.E. Murr, J.J. Bang, E.V. Esquivel, P.A. Guerrero, and D.A. Lopez. 2004. Carbon nanotubes, nanocrystal forms, and complex nanoparticle aggregates in common fuel-gas combustion sources and the ambient air. Journal of Nanoparticle Research. 6:241–251. ↑ R.L. Vander Wal, 2002. Fe-catalyzed single-walled carbon nanotube synthesis within a flame environment. Combust. Flame. 130:37–47. ↑ A.V. Saveliev, W. Merchan-Merchan, and L.A. Kennedy. 2003. Metal catalyzed synthesis of carbon nanostructures in an opposed flow methane oxygen flame. Combust. Flame. 135:27–33. Retrieved February 13, 2009. ↑ M.J. Height, J.B. Howard, J.W. Tester, and J.B. Vander Sande. 2004. Flame synthesis of single-walled carbon nanotubes. Carbon. 42:2295–2307. ↑ S. Sen, and I.K. Puri. 2004. Flame synthesis of carbon nanofibers and nanofibers composites containing encapsulated metal particles. Nanotechnology. 15:264–268. Retrieved February 13, 2009. ↑ 70.0 70.1 J. Kolosnjaj, H. Szwarc, and F. Moussa. 2007. Toxicity studies of carbon nanotubes. Adv Exp Med Biol. 620:181–204. ↑ 71.0 71.1 Alexandra Porter, 2007. Direct imaging of single-walled carbon nanotubes in cells. Nature Nanotechnology. 2007. 2(11):713–7. Retrieved February 12, 2009. ↑ 72.0 72.1 C.W. Lam, J.T. James, R. McCluskey, S. Arepalli, and R.L. Hunter. 2006. A review of carbon nanotube toxicity and assessment of potential occupational and environmental health risks. Crit Rev Toxicol. 36(3):189–217. ↑ 73.0 73.1 C. A. Poland, 2008. Carbon nanotubes introduced into the abdominal cavity of mice show asbestos-like pathogenicity in a pilot study. Nature Nanotechnology. 3(7):423–8. Retrieved February 13, 2009. ↑ Video commentary. nanotechproject.org. Retrieved February 13, 2009. ↑ Min-Feng Yu, 2000. Strength and Breaking Mechanism of Multiwalled Carbon Nanotubes Under Tensile Load. Science. 287:637–640. ↑ Mason Inman, 2006. Legendary Swords' Sharpness, Strength From Nanotubes, Study Says. National Geographic News. Retrieved February 13, 2009. ↑ Secret's out for Saracen sabres. New Scientist. Retrieved February 13, 2009. ↑ Brad C. Edwards, 2003. The Space Elevator. (Houston, TX. B.C. Edwards. ISBN 0974651710). ↑ A. Akturk, 2007. Terahertz current oscillations in single-walled zigzag carbon nanotubes. Physical Review Letters. Retrieved February 13, 2009. ↑ Henk W.C. Postma, Tijs Teepen, Zhen Yao, Milena Grifoni, Cees Dekker. 2001. Carbon Nanotube Single-Electron Transistors at Room Temperature. Science. 293(5527):76. Retrieved February 13, 2009. ↑ Philip G. Collins, Michael S. Arnold, and Phaedon Avouris. 2001. Engineering Carbon Nanotubes and Nanotube Circuits Using Electrical Breakdown. Science. 292(5517):706–709. Retrieved February 13, 2009. ↑ Jin Song, Whang Dongmok, Michael C. McAlpine, Robin S. Friedman, Wu Yue, Charles M. Lieber. 2004. Scalable Interconnection and Integration of Nanowire Devices Without Registration. Nano Letters. 4(5):915–919. Retrieved February 13, 2009. ↑ Yu-Chih Tseng, 2004. Monolithic Integration of Carbon Nanotube Devices with Silicon MOS Technology. Nano Letters. 4(1):123–127. Retrieved February 13, 2009. ↑ Lei Ding, Alexander Tselev, and Jinyong Wang et al. 2009. Selective Growth of Well-Aligned Semiconducting Single-Walled Carbon Nanotubes. Nano Letters. 9(2):800–805. Retrieved February 13, 2009. ↑ Jean-Christophe P. Gabriel, 2003. Large Scale Production of Carbon Nanotube Transistors: A Generic Platforms for Chemical Sensors. Mat. Res. Soc. Symp. Proc. 762:Q.12.7.1. Retrieved February 13, 2009. ↑ Nanōmix - Breakthrough Detection Solutions with the Nanoelectronic Sensation Technology. nano.com. Retrieved February 13, 2009. ↑ Jean-Christophe P. Gabriel, and Keith Bradley, Philip Collins. Dispersed Growth Of Nanotubes on a substrate. freepatentsonline.com. Retrieved February 13, 2009. ↑ Keith Bradley, Jean-Christophe P. Gabriel, and George Gruner. 2003. Flexible nanotube transistors. Nano Letters. 3(10):1353–1355. Retrieved February 13, 2009. ↑ Peter N. Armitage, Keith Bradley, Jean-Christophe P. Gabriel, and George Gruner. Flexible nanostructure electronic devices. freshpatents.com. Retrieved February 13, 2009. ↑ M.A. Mohamed, et al. 2007. Fabrication of spintronics device by direct synthesis of single-walled carbon nanotubes from ferromagnetic electrodes. Sci. Technol. Adv. Mater. 8:292. Retrieved February 13, 2009. ↑ New Flexible Plastic Solar Panels Are Inexpensive And Easy To Make. Science Daily. Retrieved February 13, 2009. ↑ MIT LEES on Batteries. MIT. Retrieved February 13, 2009. ↑ Ravi Singh, 2005. Binding and condensation of plasmid DNA onto functionalized carbon nanotubes : Toward the construction of nanotube-based gene delivery vectors. J. Am. Chem. Soc. 127(12):4388–4396. Retrieved February 13, 2009. ↑ Christopher J. Gannon, Paul Cherukuri, Boris I. Yakobson, Laurent Cognet, John S. Kanzius, Carter Kittrell, R. Bruce Weisman, Matteo Pasquali, Howard Schmidt, Richard E. Smalley, and Steven A. Curley. 2007. Carbon nanotube-enhanced thermal destruction of cancer cells in a noninvasive radiofrequency field. Cancer. Dec:2654. ↑ Trevor Simmons, 2007. Large Area-Aligned Arrays from Direct Deposition of Single-Wall Carbon Nanotubes. J. Am. Chem. Soc. 129(33):10088–10089. Retrieved February 13, 2009. ↑ Hot nanotube sheets produce music on demand. New Scientists News. Retrieved February 13, 2009. ↑ T. Yildirim, et al. 2000. Pressure-induced interlinking of carbon nanotubes. Physical Review B. 62:19. Edwards, Brad C. 2003. The Space Elevator. Houston, TX. B.C. Edwards. ISBN 0974651710. Fowler, P.W., and D.E. Manolopoulos. (1995) 2007. An Atlas of Fullerenes. reprint ed. Mineola, NY: Dover Publications. ISBN 0486453626. Harris, Peter J.F. 2009. Carbon Nanotube Science: Synthesis, Properties and Applications. Cambridge, UK: Cambridge University Press. ISBN 9780521828956. Meyyappan, M. 2005. Carbon Nanotubes: Science and Applications. Boca Raton, FL: CRC Press. ISBN 0849321115. O'Connell, Michael. 2006. Carbon Nanotubes: Properties and Applications. Boca Raton, FL: CRC Press. ISBN 9780849327483. Carbon nanotech may have given swords of Damascus their edge, Nature 2006. EU Marie Curie Network CARBIO: Multifunctional carbon nanotubes for biomedical applications. Medical applications of carbon nanotubes. Forming carbon nanotube composites by directly coating forests with inorganic materials using low pressure chemical vapor deposition. http://iopscience.iop.org/1367-2630/5/1/E04/ Focus on Carbon Nanotubes. This page was last modified on 10 January 2017, at 20:45.